One of the leading causes of damage to stables is a fire outbreak. This is one of the most dangerous disasters that could befall your stable or barn because it could easily destroy the unit and greatly injure the animals kept inside. Unfortunately, stable fires occur more frequently than some people think. The good news is that such incidents are also completely preventable if the problem is well understood and the right precautions are taken. The most common cause of stable fires is the ignition of hay that is stored inside the shed or unit. Many farmers keep hay for their animals to feed on but dried grass is highly flammable, so it greatly increases the chance for your stable to catch and spread fire. Instead, hay should be kept in a separate barn away from the stables. Wherever it is kept, it is important to keep the hay dry and away from any sources of moisture since damp hay can encourage microbial action, generating internal heat. This can lead to ignition, or worse —an uncontrollable haystack fire. So, make sure to keep your hay away from leaky gutters, ceilings and other wet surfaces. If some bales do get damp, then close monitoring is essential. Igniting hay is not the only cause of stable fires. Damaged electrical appliances are also a major risk factor. Any cables that are exposed due to damage from rodents or general wear and tear may produce a spark that could start a fire. This applies for machines such as A/C units as well. Bad habits can also start fires, which may necessitate change. Cigarette butts can ignite the materials in the stables, as well as oily rags or towels that are left lying around. So, remember to keep the stables as clean as possible to prevent this irreversible problem. Fires in stables are dangerous and potentially deadly for both humans and animals on any Perth farm or home. Fortunately, these kinds of fires are also very preventable by adhering to safety practices and by removing hay and potential fire starters inside your unit. If an accident should occur, stables should be fitted with smoke alarms and water systems to put fires out to keep everyone safe. 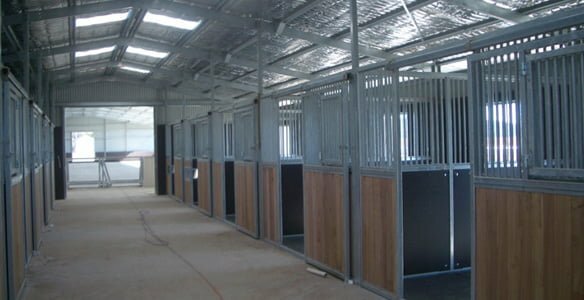 To learn about how you can design stables with all of these safety features in mind, call 1300 778 628.